I am a Missouri native. Not only am I a Missouri native, but I was born and raised in here in Columbia. I can see the high school I attended from my backyard. During a football game, it is so loud that my backyard garden might as well be inside Hickman’s stadium. A plan for an agricultural park. 'This will be a place where people can come to every day to be inspired by the abundance and bounty that growing your own food can provide,' said Carrie Hargrove on this month's installment of Farm Your Yard. Carrie Hargrove introduces the idea of an agricultural park where area kids and adults can see first-hand where their food comes from. I live less than a half mile away from the college that I graduated from. In a day in age where people and families spread far and wide across the country, and the world, I have not moved very far. Needless to say, I am deeply rooted to this part of the world. Some of the earliest memories I hold are when my parents would take me and my brother to a U-pick farm near Columbia every October to pick pumpkins, enjoy the early fall weather, and try desperately to pet a chicken. I was pretty young when this farm closed its doors- probably around 5 or so- but I still remember how much I wanted to catch a chicken, just so that I could befriend it. I still remember taking pictures with my family near the pumpkins, I still remember what the inside of the barn looked like. So, you know, who knows why the things that stick in a kids’ head stick. Who knows how directly those day trips influenced me over 20 years later when I was helping to found the Columbia Center for Urban Agriculture, an educational non profit that works to enhance our community’s health by connecting people to agriculture and the land. I don’t have a psychology degree, but I have to say that exposure to a farm at an early age, and my memories of having fun on that farm, surely positively shaped my perception of food and agriculture for the rest of my life. For my internship during college I spent a summer at the Heifer Ranch in Perryville, Arkansas teaching kids about economic development through sustainable agriculture. Each cohort of kids stayed at the ranch for a week and worked on the ranch, underwent team building exercises and participated in an immersion exercise that taught them about resource distribution and wealth across the globe. At the beginning of the immersion exercise, we would give each kid a piece of paper and have them draw their answers to various questions we posed to them. One of the questions we always asked was “where does your food come from?” Without fail kids would draw some sort of variation of a grocery store. Sometimes it was Wal-Mart, sometimes it was the corner mini-mart, but never, never was it their backyard garden, a farmer’s market, or their own family farm. This experience for me hit me like a ton of bricks. There are some very important steps before the grocery store that most kids, adults even don’t think about. But I would argue that it is so important to think about the steps before the grocery store because how is someone supposed to eat celeriac if they have no idea what celeriac is? Celeriac, by the way, is the closest thing to celery we can grow here in the mid west, It is real weird looking but tastes just like celery. Its great. But that’s my whole point, why would you want to eat this knobby, off white, amorphous root thing if you have no concept of what it is? I was raised on iceberg lettuce, and when I started gardening I was amazed by the sheer diversity of salad greens available. It took me a few years of gardening and spending time at our farmer’s market to really appreciate the wide range of flavors from arugula to mizuna to endive. Over the weekend I even thought to myself, dang it! I wish I had some escarole for this salad. That thought would never have crossed my mind if I weren’t a gardener or someone who shops at the farmer’s market. The key to getting kids to eat lots of fruits and vegetables is exposure: when someone learns about celeriac either through seeing it being grown or going out on a limb and growing it in their own garden, that is the point at which someone wants to eat it. The vegetable must be put into context conceptually before someone wants to put it on their plate. Right? So, if it takes giving a kid the opportunity to pluck leaves, to wash those leaves, and help make a salad to get them to want to eat spinach, then let’s do it! As a community, let’s take our kids outside to see and experience where food comes from. Research says that kids that participate in preparing meals with their family are more likely to want to eat the food they help prepare. So let’s give all of the school children of Columbia hands on cooking lessons with fresh fruits and vegetables to encourage healthy eating habits. Let’s teach kids that vegetables taste good so that they are encouraged to get a family garden started, or to encourage their parents to buy fruits and vegetables from our local farmers at the farmer’s market. I think it would be great if every kid in Columbia had the opportunity to pull a carrot out of the ground, squeal with excitement, hose that carrot off and eat it immediately. I want every kid in the Columbia Public School system to know first hand that a carrot pulled out of the ground is worlds better- and that is not a subjective statement- than a carrot purchased in a grocery store. And I am happy to say that these aren’t just dreams, this will actually happen in Columbia. We currently teach kids and adult about gardening and food on a 1.3 acre urban farm. But we are growing and soon Columbians will have a much larger space to learn about good food. Currently, CCUA is working with the Columbia Farmers Market, Sustainable Farms and Communities and the Columbia Parks Department to build an Agriculture Park out where the ARC and the Columbia Farmer’s Market are located. This 10-acre site will expand the Columbia Farmers Market by constructing a covered building for the market, the site will have a sports practice field, and on site fruit and vegetable production will grow 50,000 pounds of fresh food for local food pantries, and thousands of children and adults will visit the site every year to see how food is grown, to get their hands dirty, and to learn how they can grow their own at home. This will be a place where people can come to every day to be inspired by the abundance and bounty that growing your own food can provide. I hope that with this new agriculture park, there will be a day in the near future when a kid from Columbia will be asked “Where does your food come from”, and they will say their backyard. 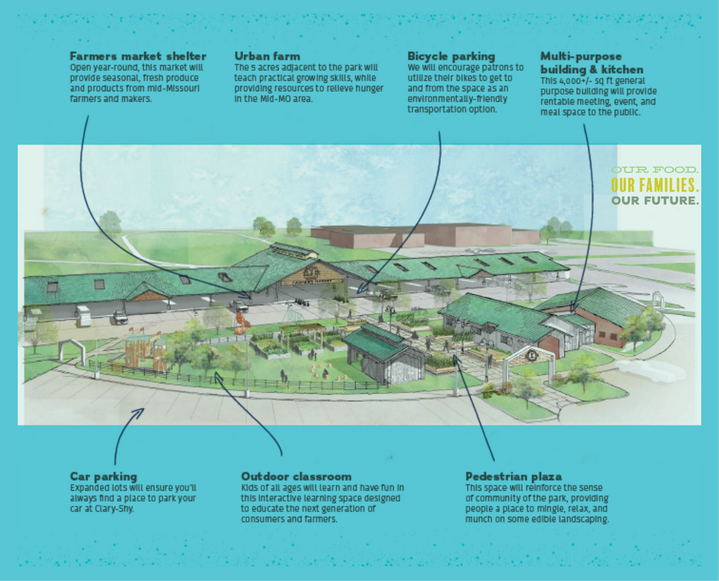 To learn more about the all of the exciting details of the future Agriculture Park visit buildthistown.org. To learn more about what CCUA does, visit our website or our Facebook page. Happy gardening! I got into a conversation with a coworker a few weeks back about how hard it was to be a vegetable farmer here in the US. I think being a farmer of anything anywhere is a tough, round the clock, un-glorified job, but having been a small scale produce farmer for a few years I know firsthand that market farming vegetables is demanding. Carrie Hargrove discusses how to cultivate acceptance of your vegetables no matter how imperfect they may be. Farm Your Yard is heard each second Tuesday on KBIA's Thinking Out Loud. Not to toot my own horn, but I have a great backyard garden. I really can’t take much of the credit for my backyard garden because I am lucky to have amazing soil in my backyard. Without good, living soil, I wouldn’t be much of a gardener. Carrie Hargrove looks closely at the life in her garden and shares tips for you on how to build your landscape's soil.